Exposure to UV light is the cause of a devastating disease found in North America. According to USDA Forest Service, the disease”can only infect bats during hibernation because it has a strict temperature growth range of about 39-68 degrees Fahrenheit”. Bats are very sensitive to the ultra-violet light which causes the P. destructans fungal pathogen(any disease-producing agent) to trigger the disease. 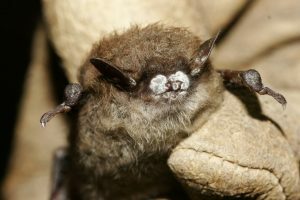 A bat affected by White Nose Syndrome. When is a bat most at risk? 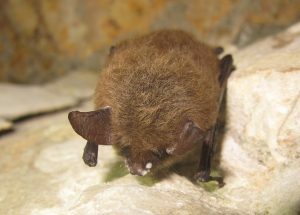 During hibernation, bats face a high risk of the white nose syndrome. WNS officials claim that the bats act strangely during cold winter months, including flying outside in the day and clustering near the entrances of hibernacula (winter quarters for a hibernating animal). Bats have been found sick and dying in unprecedented numbers in and around caves and mines. WNS has killed more than 5.7 million bats in eastern North America. This bat is in hibernation and at risk of WNS. A research team has identified in the pathogen an enzyme that repairs DNA causing the team to expose the fungi to DNA damaging agents, including different wavelengths and intensities of UV light. Consequently, they found that a low dose exposure of UV-C light resulted in about 15 percent survival of P. destructans. Whole-Grain Bread: The Healthy Choice…or is it? A Painful Death for Lobsters? Ummm, not sure what this is, but UV-C light kills the fungus, it doesn’t create it. This reads exactly the opposite of what it should.